NEW YORK (TheStreet) -- The weather is finally getting warmer and consumer sentiment is improving, or so we were told today with the release of the University of Michigan Sentiment Index. The index moved up to 82.6 from 80 in the prior reading and is now at the highest level this year. With this improvement, one would expect consumer cyclical stocks to be leading the markets higher but the opposite had been true for much of this year. The consumer cyclicals are currently the worst performing sector in the S&P 500 this year, and by a wide margin, down close to 5% on the year while the S&P 500 is flat (see chart below). 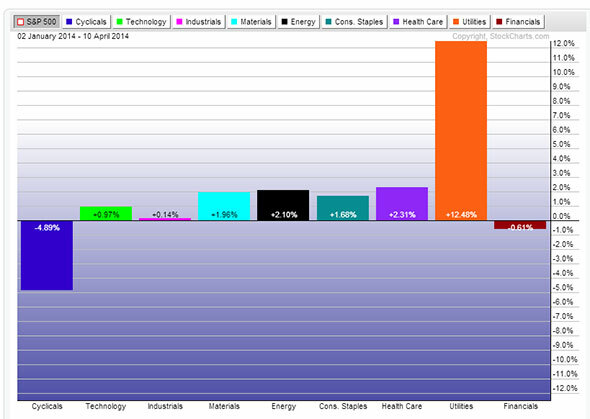 In stark contrast, the defensive utilities sector is the top performing sector this year. In the 2014 Dow Award-winning paper "An Intermarket Approach to Beta Rotation," my colleague Michael A. Gayed and I show why utility stocks in particular are historically a harbinger of higher volatility. We are seeing that first hand this year with utilities strength preceding both the January-February correction and the current pullback. The combination of consumer cyclical weakness and defensive strength is notable, particularly this late in the cycle. The economic expansion will hit five years this June, and the bull market in stocks is already five years old. That doesn't necessarily mean that it has to end right here but investors should be on the lookout for warning signs as we are likely closer to the end than the beginning. 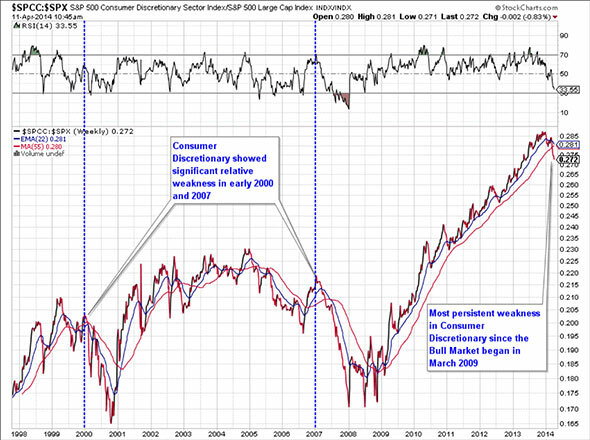 Looking at a longer-term chart of the consumer discretionary sector relative to the S&P 500 provides some perspective on why persistent weakness in consumer stocks is important for the overall market. After bull market runs from 1995 to 1999 and 2003 to 2006, we saw persistent relative weakness in the sector in 2000 and 2007 (see chart below). This weakness preceded bear markets which saw more than 50% declines in the S&P 500. Will the weakness in consumer stocks today lead to similar broad market declines, with a bear market commencing within the next year? We don't know. The best we can say is that as long as this weakness is persisting, a more defensive, cautious outlook is warranted. This is particularly true given where we are in the cycle and the fact that it has been almost two years since the S&P 500 suffered a 10% correction.